Since May 4, 1978, the day it was attacked by the South African Defence Force, Cassinga has been a key site in the national history of Namibia. Within days of the assault, news spread through the exile community and around the world about the attack on SWAPO's refugee camp at Cassinga, which had left at least 600 dead and hundreds more wounded. In the years that followed, Namibians have narrated a history of Cassinga that highlights the brutality of the South African apartheid regime, the bravery of those who resisted it, and the magnanimity of those who reconciled with their former oppressors. But when we invoke Cassinga's history, do we actually remember Cassinga? I often asked myself this question when, from 2006 to 2009, I prepared a doctoral dissertation about Cassinga and other camps administered by SWAPO in exile. As I learned, the dominant story of the 'refugee camp' does not begin to describe the collection of people, offices and practices that formed in and around Cassinga. At the same time, the apartheid government's claim that Cassinga was a 'military camp' is also misleading, obscuring salient qualities of this community. In this exhibition I present histories of the SWAPO camp at Cassinga and of photographs which have shaped perceptions of it since the South African attack. In so doing, I draw from a range of sources made available to me during my doctoral research. These include documentary and visual materials housed in public archives, interviews that I conducted with SWAPO officials who administered the camp, and photos which I took during a trip to Cassinga in September 2007. Through these sources I display happenings that have been excluded from competing narratives about the 'refugee' and 'military' camp. And I raise questions about how such exclusions are reproduced in, and impact on, southern Africa, whose people access social status through similar histories of racism, resistance and reconciliation. I am grateful to all those who have supported this exhibition by participating in my research and permitting its display.1 It should be clear, however, that the responsibility for the material presented in this exhibition is my own. As you look around, you may wish to share your views on the exhibition, Cassinga and related topics. If so, I encourage you to take a copy of my business card, available in the exhibition area, and contact me. Also, if you would like to know more about my research, you may now access my dissertation in several locations, including the Special Collections at the University of Namibia and the Centre for Humanities Research at the University of the Western Cape. The title is 'Exile History: An Ethnography of the SWAPO Camps and the Namibian Nation'. Moreover, transcriptions and recordings of the interviews that I prepared for the dissertation are available at the National Archives of Namibia and the Mayibuye Centre at UWC. Please ask the staff at these locations about how you may access this material. 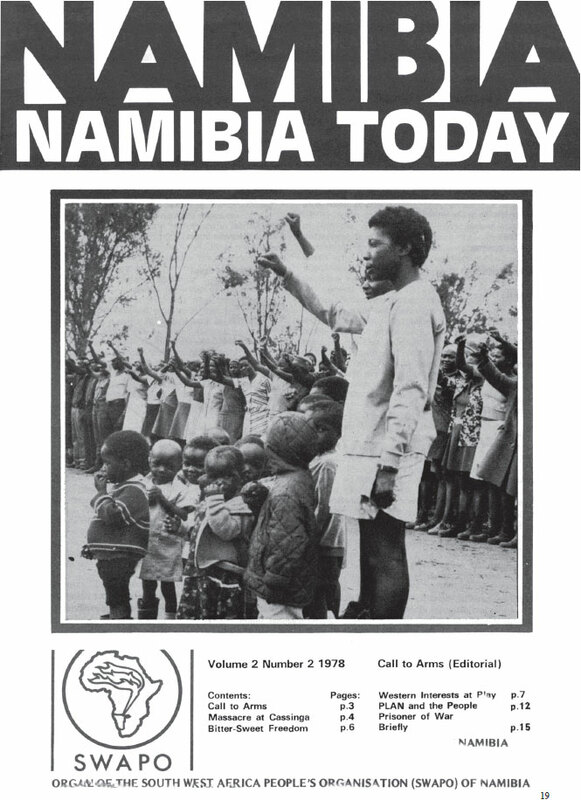 It appears that the first Namibian exiles encountered Cassinga in April 1976. 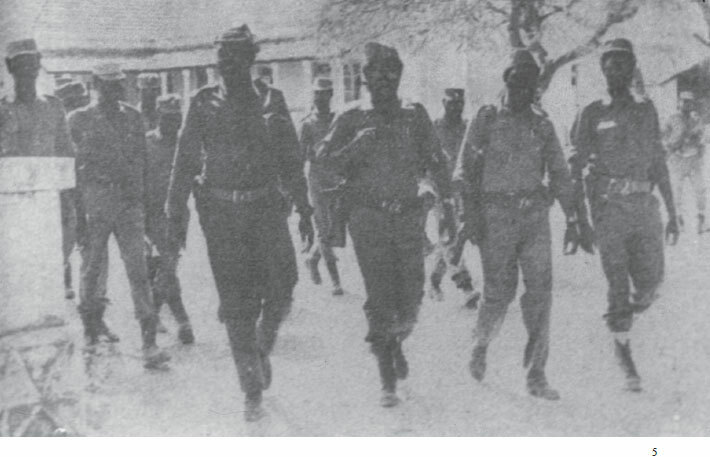 At that time SWAPO was transferring PLAN combatants from southwestern Zambia, where most had been living during the early 1970s, to southern Angola, which would become PLAN's base of operations during the late 1970s and 1980s. In the course of this transfer, many combatants were sent to a farm on the outskirts of Huambo in central Angola. From there SWAPO trucks transported them to 'the Angolan front', a collection of mobile camps that PLAN had recently established near the Angolan-Namibian border, to the west and east of Ondjiva. In conjunction with these trips, Namibians passed through Cassinga, a village located about halfway between Huambo and the front. Some weeks later, after several more groups had travelled from Huambo through Cassinga en route to the front, a group of PLAN soldiers led by Army Commander Dimo Hamaambo moved to Cassinga to inhabit the village.2 When they arrived, the village was empty.3 Although there were subsistence farmers living across the Cuilonga River about a kilometre to the west, no people were living at Cassinga itself or on the low-lying hill on which it is situated when Hamaambo and his entourage arrived. Nonetheless, the former inhabitants, who had been workers and administrators at a nearby iron mine before they fled during the Angolan Civil War,4 had left about twenty brick buildings, which appear to have been used previously as offices, dormitories and warehouses.5 There was also a dirt road lined with gumtrees that passed through the middle of the village, connecting Cassinga with Jamba and the Angolan interior to the north and Techamutete and the Namibian border to the south. 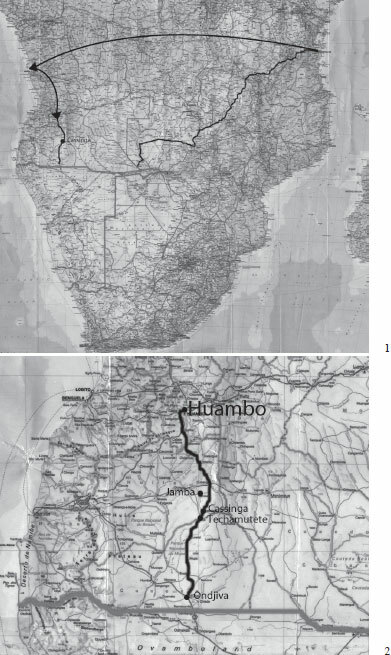 1 his map marks a route which many PLAN combatants took in 1976 when they were transported from the Zambian to the Angolan front. First, they were driven by truck from southwestern Zambia to Dar es Salaam. Then, from Dar es Salaam they were flown to Luanda and again to Huambo. 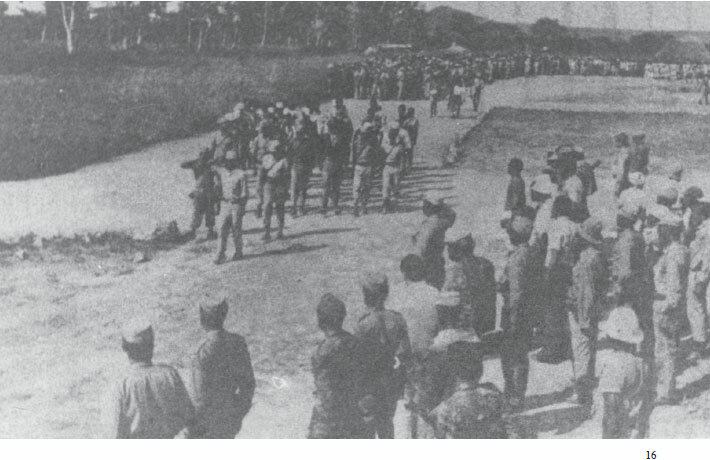 From Huambo combatants were driven to the front. It should be noted that some combatants crossed into Angola from their camps in southwestern Zambia, but this was less common owing to conditions created by the war in Angola. 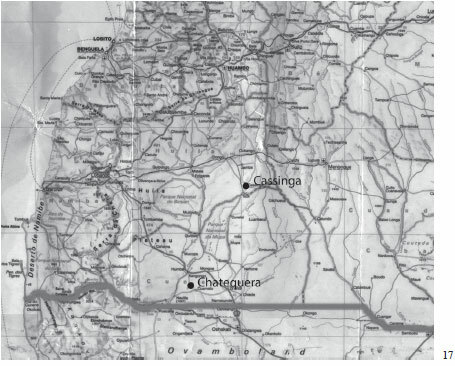 3/4 On this page are two maps of Cassinga. The first map was created by the South African Defence Force, probably with the aid of photographs taken by SADF planes shortly before the attack.7 The map's legend reflects perceptions among South African military personnel about how camp space was used. 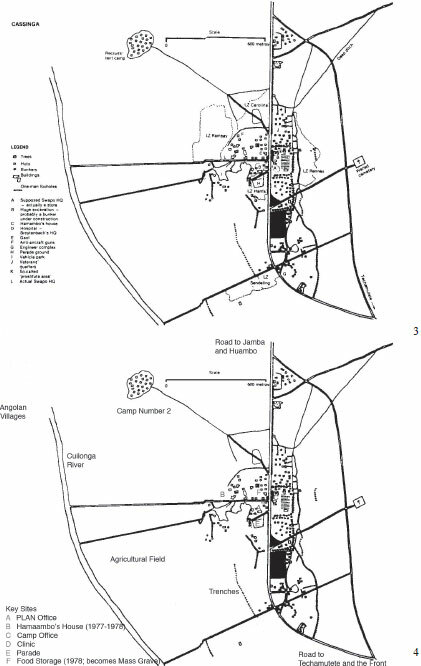 The second map derives its layout from the first but differs from it, by highlighting how camp space was used according to people who lived at and administered Cassinga. Photographs of several sites identified in the second map are displayed in this exhibition. 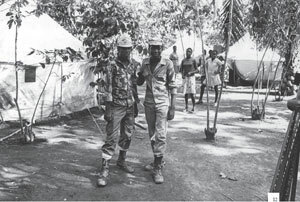 Among those who accompanied Dimo Hamaambo to Cassinga were Charles 'Ho Chi Minh' Namoloh and Mwetufa 'Cabral' Mupopiwa, Namibia's present Minister of Defence and Deputy Permanent Secretary of Defence respectively.8 There they were assigned to help Dimo Hamaambo establish an administrative office for PLAN.9 Initially five people worked in this office: Hamaambo, his personal bodyguard and driver, Namoloh and Mupopiwa.10 Of these only Hamaambo, Namoloh and Mupopiwa were involved in the office's administrative work.11 Working out of their bedroom at the office, Namoloh and Mupopiwa began to record and file information about PLAN operations along the Angolan-Namibian border, such as where they took place, who was involved and who died in combat, as well as logistical matters, such as supplies of weapons, food and medicine. At the time when the PLAN office was formed at Cassinga, it did not have access to radio communication. As a result Namoloh and Mupopiwa frequently drove to and from the front, communicating information that they gathered at the front to various SWAPO officials and transporting requested supplies back to the soldiers there.12 To accomplish this communication and transport work, the office maintained a division of labour. Namoloh took trips to the front and to Huambo, where most of the maize-meal for soldiers at the front was purchased.13 Mupopiwa, who had grown up partly in Angola and was fluent in Portuguese, was responsible for communicating with the Angolans. His tasks included corresponding with people administering the Angolan warehouses in Luanda, where donations of weapons and food arrived, by sending letters on trucks travelling to and from the Angolan capital. He was also in regular contact with Cuban soldiers based at Techamutete, who had maintained a base there since shortly after the Cubans' entry into Angola in 1975 and were assisting the Namibians at Cassinga with logistical support. 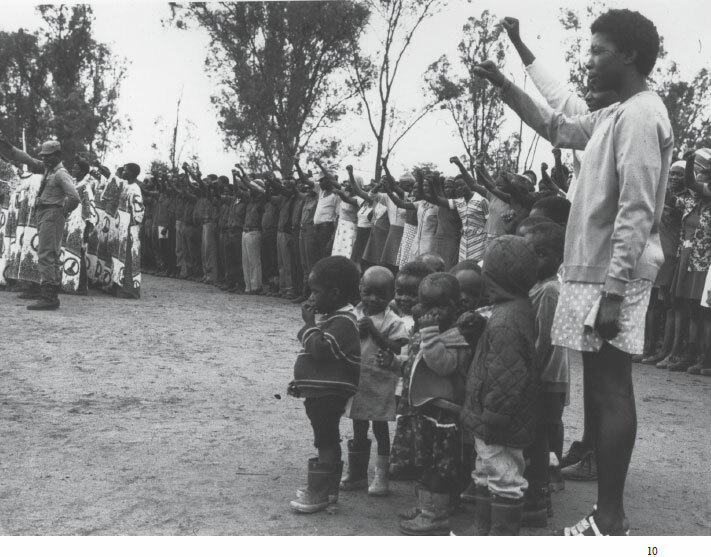 After SWAPO Defence Headquarters was founded outside Lubango in late 1976 or early 1977,14 Mupopiwa also began to make regular trips to communicate with SWAPO and Angolan officials there. 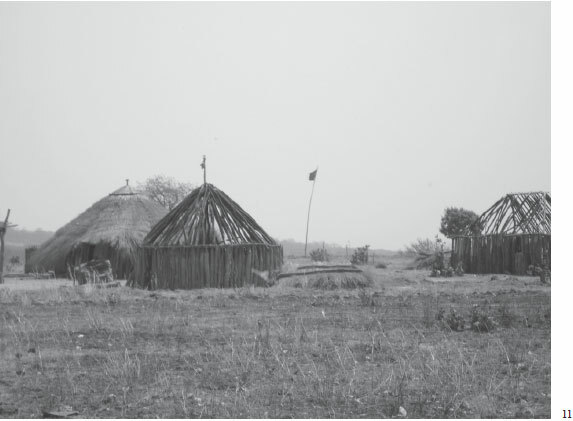 By 1977 SWAPO had begun to move some of those residing in Cassinga north to Jamba, where the liberation movement had gained permission to administer another camp.26 Most of those transferred then and over the following months were women and children, who had access to better medical facilities and school resources in the Angolan town, where SWAPO medical personnel and teachers were also stationed.27 Similarly, after SWAPO had established its offices in Luanda and Defence Headquarters in Lubango, exiles who were seen as fit for military training or further education abroad were transferred from Cassinga to other places. 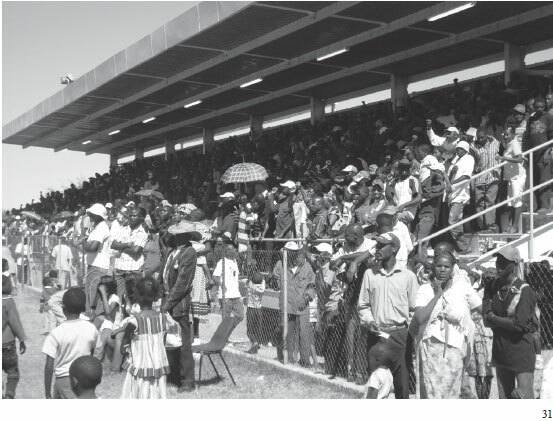 Nonetheless, from 1976 through 1978 the movement from Namibia into exile continued unabated, and the camp office administered the various Namibians passing through Cassinga. 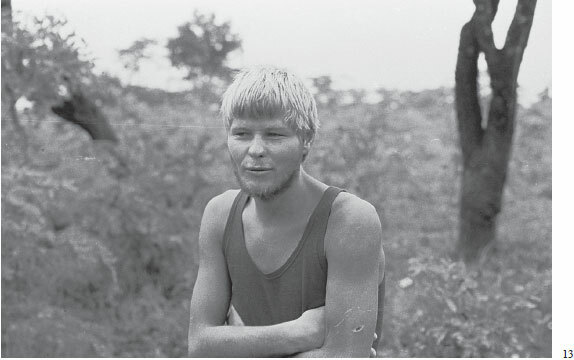 13 This is a photograph of Johan van der Mescht, the South African soldier captured by SWAPO on the night of February 18-19, 1978 outside Elundu.41 The photo was taken by Per Sanden and Tommy Bergh, Swedish film-makers who were travelling with the PLAN unit involved in the Elundu attack. Their mission was to collect material for a documentary film commissioned by the SWAPO leadership.42 Some weeks after Van der Mescht's capture, Sanden and Bergh filmed an interview with him at one of SWAPO's Lubango camps.43 This interview was included in a film screened by television networks in European countries beginning on May 9, 1978. 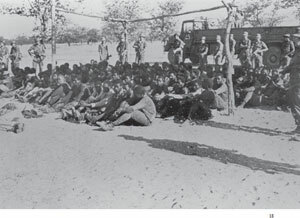 The film also included footage which Sanden and Bergh had taken at Cassinga during their visit there the week before South Africa's attack.44 Neither Sanden's film nor the coverage of it in the international press noted that Van der Mescht also spent time at Cassinga, where he was detained as a prisoner of SWAPO. Our Revolutionary Greetings, please! I have the honour to inform your Office that we have removed from Cassinga, a portion of the Namibian Community and settled it about 7 km north of the existing camp. The reasons for this move are as follows: 1. With enemy (S.A.) Air-reconnaissance work going on continuously, we came to the conclusion that S.A. racsists [sic] intend to conduct an air-raid on this camp. 2. Jamba which is already overcrowded can no longer accom[modate] more of our people and worse there is a standing order for the removal of our people. The new camp is therefore a 'security' place for children, mothers, the sick and expectants. Its [sic] not a military camp. Hoping that you will accept our explanation. 15 This letter is one of a series of documents which the SADF allegedly captured during the attack on Cassinga. Although the original is not currently accessible to the public, its contents are transcribed by Justine Hunter in her doctoral dissertation, cited below.48 The letter, attributed to Dimo Hamaambo, corroborates several points made in oral testimonies by other SWAPO officials living at Cassinga. These points include references to '(SA) Air-reconnaissance work', and efforts to move 'children, mothers, the sick and expectants' to an area outside the main camp where they might be more safe.49 Hamaambo also suggests an explanation for why trucks were not coming to Cassinga frequently to transport people from the camp in the weeks preceding the attack: namely, because Jamba was 'overcrowded' and there was 'a standing order to remove our [i.e. Namibian] people'. Perhaps these conditions in Jamba are part of the reason why there was an exceptionally large number of people, almost all without military training, residing in Cassinga on the night of May 3, 1978. South Africa's attack on the morning of May 4, 1978 at Cassinga resulted not only in mass carnage and destruction at one time and place, but also in competing histories that have continued to reproduce themselves and impact on people's lives over the more than thirty years since that day. At the same time that this statement was released, the South African government also circulated photographs and other images of Cassinga that were used to support the claim that Cassinga was a military camp. Several of these are displayed or discussed below. 17 This map identifies the location of Cassinga relative to Chatequera (codename 'Vietnam'), another SWAPO camp.52 Cassinga and Chatequera were both targets of South African forces on May 4, 1978. 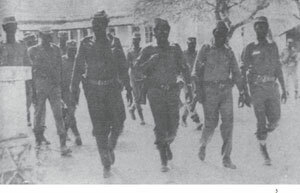 When the first news reports about the attacks were shown on South African television, film taken by SADF during the raid on Cassinga were interspersed with images of Chatequera.53 The Chatequera footage was useful for the SADF because Chatequera was better armed than Cassinga and inhabited by hundreds of trained PLAN combatants. 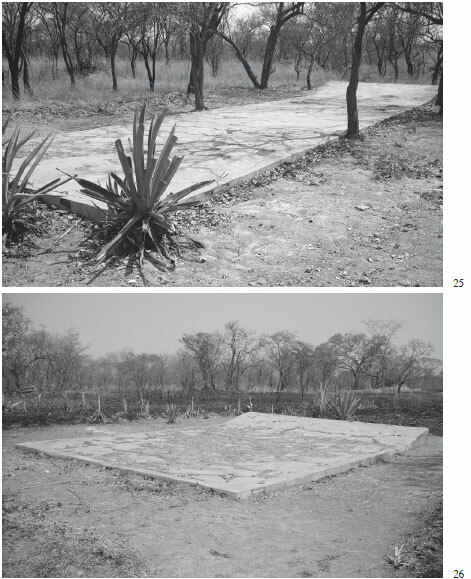 The interspersed images appear to offer evidence that Cassinga was, in fact, a 'military camp'. Central to supporting these and similar claims about Cassinga have been photographs. Several have played a role in inducing SWAPO members and their allies to accept a particular narrative of Cassinga even as more complex histories of the camp, and of the images themselves, have been obscured. 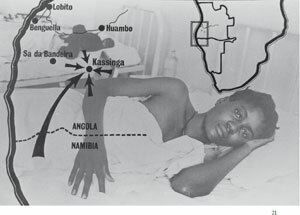 21 The photograph pictures Anna Kandume, a girl who was injured in the South African attack on Cassinga, lying on a bed at the Cuban hospital in Luanda, where many of Cassinga's wounded were sent.64 It was probably taken by one of the international journalists who visited the hospital within a few days of the raid. The maps of Cassinga and southern Africa were transposed over the original image for the cover of Namibia Today, which, in turn, was distributed among Namibian exiles and the international community. 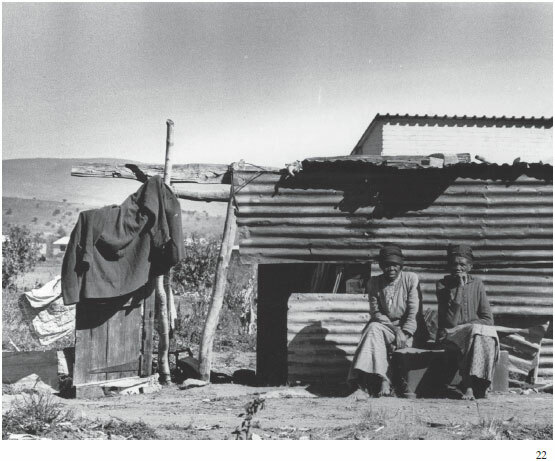 22 The caption to the copy of this photograph housed at the National Archives of Namibia reads 'Cassinga before SA massacre, two women outside house'. 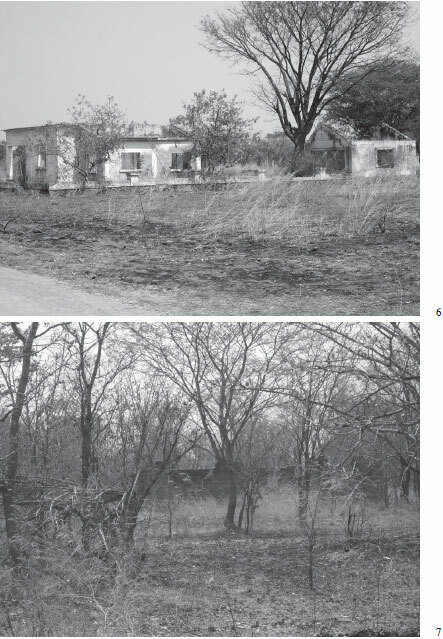 Despite this claim, all of my research participants who inhabited Cassinga doubt that this photo actually depicts the camp, particularly since none remember shacks made out of corrugated iron at Cassinga. The photo may be one of two at the National Archives of Namibia which have been attributed to Cassinga, but which were not taken at that site. In each case the photos feature destitute women or children, making them potential images for SWAPO's most famous 'refugee camp' regardless of whether they were taken at Cassinga itself. 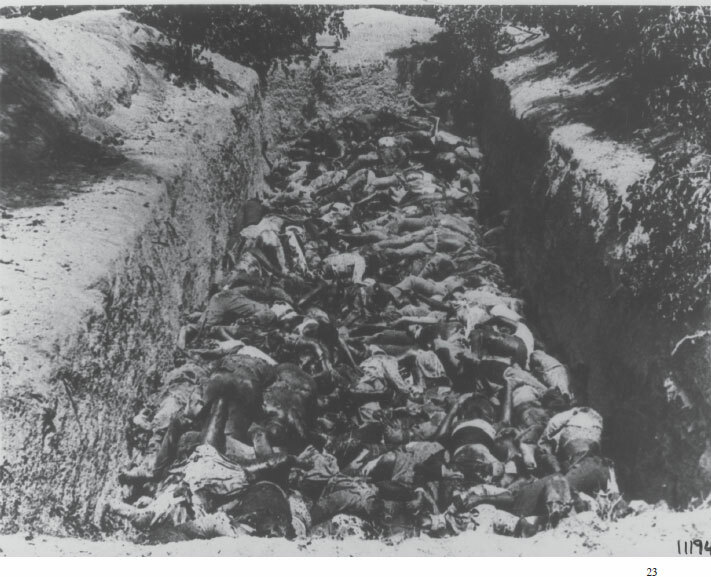 More than any other image, it is an open mass grave photographed by journalists after the attack that has become the enduring symbol of Cassinga. Taken from the grave's edge, the mass grave photos are close enough to the corpses for individual bodies, and in some cases the clothing, wounds and flies covering them, to be discernible. The photos demand a visceral reaction. In the weeks following the attack and for years to follow, SWAPO and solidarity organisations published texts alongside the photos that directed this reaction by imputing meaning to the bodies in the grave. Texts drew attention to the 'civilian' qualities of the bodies, the suffering of Namibians under colonialism, and the violence committed against oppressed people in other settings. 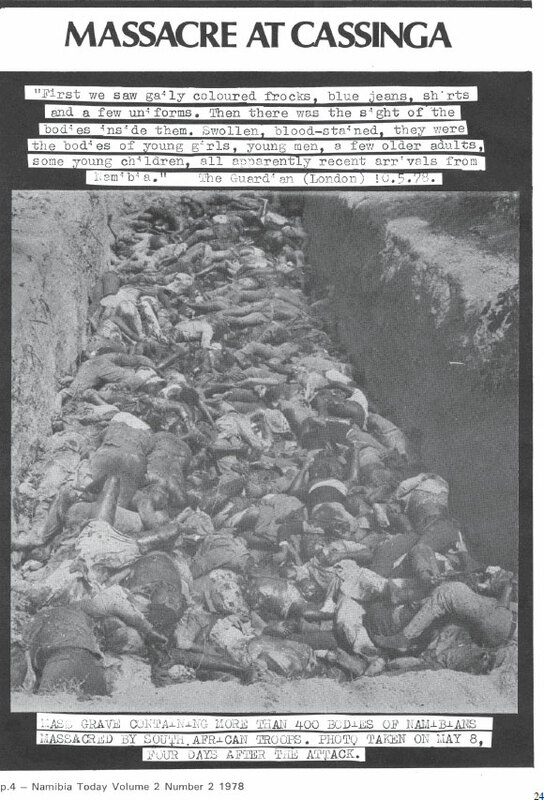 In so doing, they associated the mass grave at Cassinga with the history of the refugee camp. Nonetheless, for those who peer into the grave, it is open to perspectives which the dominant narratives of Cassinga do not permit us to see and which may be important to acknowledge. Perhaps there is some truth in what Alexander writes. But may we oppose only the story of 'authentic' refugees with the one of 'authentic' soldiers as Alexander does here? Or are there other histories which may be told, histories which honour the many, diverse victims of Cassinga; histories which include both those who were laid to rest in Cassinga's graves and those whose lives have been shaped by the national history of it? 27 This photograph of 'the Cassinga Survivors' was taken by the author at the United Nations Plaza in Katutura on May 4, 2007. Since independence, the survivors have become regular participants in the ceremonies and media programmes commemorating Cassinga Day. Repeatedly they have drawn attention to individuals who lived and died with them at Cassinga, requesting recognition for their contributions to the nation and appealing to the Namibian government for the repatriation of those buried in Cassinga's graves. In addition, there are thousands of other survivors - families and friends of those who died at Cassinga - who have grieved over Cassinga without making public statements and requests. 1 I would like to acknowledge the Centre for Humanities Research at UWC for supporting the exhibition project, the Museums Association of Namibia for assisting in the exhibition's physical preparation, the UWC Library for hosting the exhibition from April 12 to April 23, 2010, and the National Archives of Namibia for hosting it from April 29 to May 13, 2010. Special thanks are also due to Premesh Lalu, Jeremy Silvester, Allison Fullard and Werner Hillebrecht for their extraordinary help and encouragement. 2 Theopholus Kalimba, Interview 2.9.2007; Mwetufa 'Cabral' Mupopiwa 26.7.2008; Charles 'Ho Chi Minh' Namoloh 19.6.2008. 3 T. Kalimba 2.9.2007; Mupopiwa 26.7.2008; Namoloh 19.6.2008. 5 Heywood (1994) indicates that in colonial days Cassinga consisted 'of a sprawl of houses and mine buildings' (17). 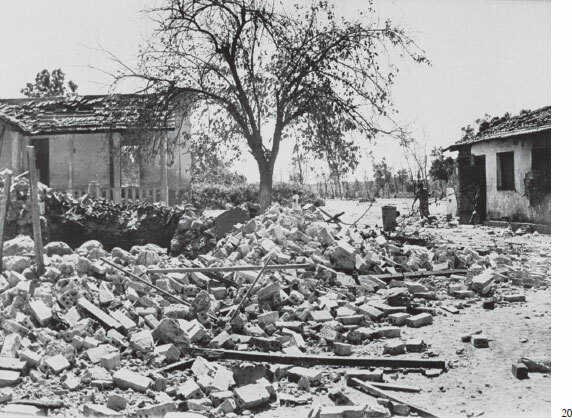 Pagano refers to 'three or four brick houses and hundreds of straw and adobe huts' that had remained empty since the start of the war (letter in The Kassinga File). Alexander indicates that, based on SADF aerial photographs, Cassinga had no more than 30 permanent buildings in 1978 (41-42). I draw my conclusions from interviews with Charles Namoloh (19.6.2008), Mwetufa Mupopiwa (26.7.2008), Darius 'Mbolondondo' Shikongo (Interviews 26.3.2007; 11.6.2007; 20.8.2007; 3.9.2007), Canner Kalimba (Interviews 1.4.2007; 13.6.2007) and a trip that I took to Cassinga with Canner and Theopholus Kalimba in September 2007. Namoloh indicates that he thinks some of the buildings that he found at Cassinga were dormitories. Shikongo refers to warehouses filled with timber that were cleared after his arrival (26.3.2007, 4, 15). 6 Ben Ulenga, Interview 12.6.2008. 7 Heywood 1994, 24; Alexander 2003, 55. 8 T. Kalimba 2.9.2007; Mupopiwa 26.7.2008; Namoloh 19.6.2008. 9 Namoloh 19.6.2008; Mupopiwa 26.7.2008. 10 Later they were joined by PLAN Political Commissar Greenwell Matongo, who moved to Cassinga in late 1976 or early 1977 (Namoloh 19.6.2008; Mupopiwa 26.7.2008; Jesaya Nyamu, Interview 3.4.2008). 11 Namoloh 19.6.2008; Mupopiwa 26.7.2008. It should be noted that Hamaambo died in 2002 (and Matongo, who later joined the PLAN office, died in exile). Therefore, according to their testimony, Namoloh and Mupopiwa are the only two living persons with knowledge of the work done in and by the PLAN office during its first months. 12 Namoloh 19.6.2008; Mupopiwa 26.7.2008. Namoloh, Mupopiwa and D. Shikongo (26.3.2007) recall that at some point while they were at Cassinga, probably in early 1977, commanders at Cassinga began to access other commanders at the front and officials in Lubango and Luanda via radio communication. 13 Namoloh 19.6.2008; Mupopiwa 26.7.2008. 14 Namoloh 19.6.2008; Mupopiwa 26.7.2008; Nyamu 2.4.2008. 15 National Archives of Namibia (NAN) Photo Archive, No. 14119. 17 C. and T. Kalimba, 2.9.2007, 2,3; D. Shikongo 11.6.2007, 40; 3.9.2007, 69; Nyamu 3.4.2007, 17; Namoloh 19.6.2008. 18 Most of those entering exile from southern Namibia during this period travelled through Botswana and were sent toSWAPO camps in Zambia. According to Kalimba and Shikongo, few, if any of these exiles, arrived at Cassinga (D. Shikongo 26.3.2007, 11-12; C. Kalimba 13.6.2007, 16). 19 Some of those who entered exile during the outbreak of the Angolan Civil War seem to have lived in these small camps near the front for many months before being transferred to any settlement to the rear. For example, Theopholus and Canner Kalimba fled from Namibia to Angola in August 1975 (C. Kalimba 2.4.2007). Unlike research participants I interviewed who entered exile before August, the month when widespread violence broke out in Angola, the Kalimbas did not move onward into Zambia. Rather, the couple moved between various camps in southern Angola until they were finally moved to Cassinga, shortly after Namibians' arrival there. 20 C. Kalimba 13.6.2007, 11, 15, 16; D. Shikongo, 33-34. 21 In Shikongo's case the title commissar denoted that he was the deputy camp commander. 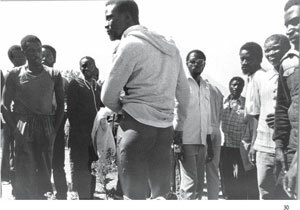 Some commissars, especially after the increased involvement of the Soviet Union with SWAPO in exile, were responsible particularly for political education. 22 D. Shikongo 26.3.2007, 3. 23 D. Shikongo 26.3.2007, 16; 3.9.2007, 77. 24 D. Shikongo 26.3.2007, 15-16; 20.8.2007, 65-66; 3.9.2007, 76-77. 25 Shikongo remembers the commander by his nom de guerre, 'Nakombole'. He died in the South African attack on Cassinga (D. Shikongo 26.3.2007, 17). 26 Kalimba 13.6.2007, 1, 4, 10, 16; Shikongo 11.6.2007, 30; Nyamu 2.4.2007; Namoloh 19.6.2008. 27 Notably, Iyambo Indongo, a trained Namibian doctor, ran the medical centre at Jamba. Canner Kalimba was a founding teacher at the school there (Kalimba 13.6.2007, 4). 28 D. Shikongo 26.3.2007, 16; 3.9.2007, 77. 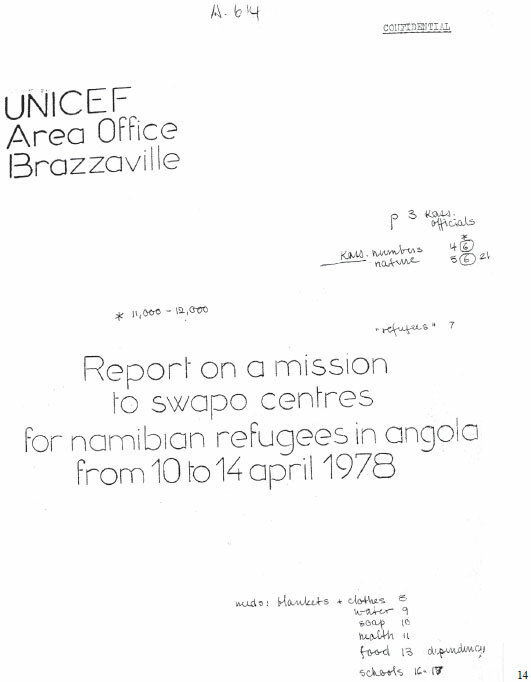 29 NAN, File A.614, UNICEF Area Office Brazzaville, 'Report on a mission to SWAPO centres for Namibian refugees in Angola from 10 to 14 April 1978', 11; Ellen Namhila, Interview 25.7.2008. 30 NAN Photo Archive, No. 12778. The photo was an acquisition from the Mayibuye Archives at the University of the Western Cape (Mayibuye) and International Defence and Aid Fund (IDAF); D. Shikongo 26.3.2007, 3, 15; 11.6.2007, 38-39. 31 C. Kalimba 13.6.2007, 14; D. Shikongo 26.3.2007, 19-20. 32 C. Kalimba 13.6.2007, 12-14; D. Shikongo 11.6.2007, 41. 33 C. Kalimba 13.6.2007, 14; D. Shikongo 26.3.2007, 19-20. 34 NAN Photo Archive, No. 12314 (Mayibuye/IDAF); D. Shikongo 26.3.2007; 11.6.2007; 3.9.2007. Namoloh 19.6.2007. Per Sanden and I also discussed footage of Namibians marching, dressed in military uniforms and carrying sticks which he filmed while he was visiting Cassinga and which was used in his film 'Here Is Namibia: Inside the Liberated Areas and Beyond' (Per Sanden, Interview 5.2.2008). 36 University of Namibia (UNAM), Katjavivi Collection, Series B1, Category 5, File No. 9, 'For Immediate Release', 4.5.1978; [ Links ] 'Back to the Border with Johan and Danger', Louis Bothma, New Era, 2.12.2009; [ Links ] D. Shikongo 11.6.2007, 39. It should further be noted that freeing Johan van der Mescht was one of the reasons stated by the South African government for its attack on Cassinga. 37 D. Shikongo 11.6.2007, 39-40. 38 D. Shikongo 11.6.2007, 35, 36. For example, when I showed Shikongo the SADF map of Cassinga, he referred to the location named 'Recruits' tent camp' as the new site which the camp commanders had created for 'the elderly, the women with children and children'. Apparently, he and other camp officials thought that, by removing them from the main camp, these groups would be less vulnerable to an aerial attack. 39 D. Shikongo 11.6.2007, 35. 40 D. Shikongo 26.3.2007, 3; 11.6.2007, 37, 43. Shikongo further notes that a group of eighty or more exiles arrived at Cassinga the night before the attack. 41 Mayibuye Photo Archive, LA 229-2-5; UNAM, Katjavivi Collection, Series B1, Category 5, File No. 9, 'For Immediate Release', 4.5.1978; [ Links ] 'Back to the Border with Johan and Danger', Louis Bothma, New Era, 2.12.2009. 44 Mayibuye Archives Centre, Box: Namibia 1978, 'SA Prisoner tells of SWAPO capture', Argus, 10.5.1978; 'Moving Plea to SWAPO', Rand Daily Mail, 12.5.1978; NAN, Institute for Contemporary History, Microfilm 78 F85: Die Transvaler, 11.5.1978; Microfilm 78 F83: 'Swapo wil praat oor sappeur', Die Volksblad, 9.5.1978. 45 NAN, File A.614, 'UNICEF Report'. 46 For a discussion of these numbers see Heywood 1994, 19. UNICEF's figure also seems implausible when put in relation to the number that the Report projects for Jamba (6,000), the on-going mass migration of Namibians into exile during the 1980s and the number of exiles repatriated to Namibia in 1989. 47 Namoloh 19.6.2007; Mupopiwa 26.7.2007; C. Kalimba 2.4.2007; 13.6.2007; D. Shikongo 26.3.2007; 13.6.2007;20.8.2007; 3.9.2007. 48 J. Hunter, 'Die Politik der Erinnerung und des Vergessens in Namibia seit der staatlichen Unabhängigkeit' (Doctoral Thesis, Universität Freiburg, 2005), 80. The letter has also been published in German translation in Hunter's book Die Politik der Erinnerung und des Vergessens in Namibia: Umgang mit schweren Menschenrechtsverletzungen der ära des bewaffneten Befreiungskampfes, 1966 bis 1989 (Frankfurt am Main: P. Lang, 2008), 57. According to Hunter, the letter was included among the personal files of the late Hannes Smith, formerly the editor of the Windhoek Observer. These files have recently been transferred to the National Archives of Namibia, but are not yet accessible to researchers. 49 Some former Cassinga inhabitants refer to an area like the one which Hamaambo mentions here as 'Camp No. 2' (See 'Cassinga Revisited', The Namibian, 7.5.1999). But whereas they and the SADF map of Cassinga suggest that the 'Camp No. 2' was located less than 1 km outside the main camp, Hamaambo's letter refers to a distance of 7 km. 50 NAN, File A.614, Annex I to the 'UNICEF Report'. 51 NAN Photo Archive, No. 14120. 52 The location of Chatequera/'Vietnam' on the map is based both on the estimates of research participants and South African newspaper reports which identify Vietnam as a camp located about 30 kilometres from the border and 75 kilometres from Ruacana (NAN, Institute for Contemporary History, Microfilm 78 F84, 'Nog Dokumente: SWAPO baie lief om te spog', Die Suidwester, 9.5.1978; NAN, M187/1 'News Footage from SABC-TV'. 53 NAN, M187/1 'News Footage from SABC-TV'; Heywood 1994, 8. 54 Mayibuye Photo Archive, LA 343-3-2. 55 NAN, Institute for Contemporary History, 78 F80, 'I visited "Vietnam" and saw the aftermath of the battle', Pretoria News, 6.5.1978. Magdalena Nghatanga offers a similar account of being photographed after her capture at Chatequera in IDAF's 'Remember Kassinga - And Other Papers on Political Prisoners and Detainees in Namibia. Fact Paper onSouthern Africa No. 9', available at Mayibuye. 56 NAN, 'IDAF Newscuttings Database', A.570 IDAF, 1/97, A01.1C.011, 1979 July-Dec.
57 This point about the identity of the 'Kassinga detainees' was confirmed by South Africa's Truth and ReconciliationCommission (Volume 2, 52-53). 59 UNAM, Katjavivi Collection, Series B1, Category 4, 'Address Given by Peter Katjavivi, SWAPO Secretary forInformation and Publicity to the World Conference for the Eradication of Racism and Racial Discrimination, Basle, May 18-21, 1978'. 60 Sanden and another cameraman, Rudi Speer, had first made films with PLAN in southwestern Zambia and the Caprivi Region of Namibia in 1973. Apparently, these are the first and only filmmakers to have worked inside PLAN for many years. Sanden developed personal relationships with Sam Nujoma and other SWAPO leaders from the early 1960s when he became involved in anti-apartheid activities as a student in Sweden (Sanden 5.2.2008, 1-2). 64 C. Kalimba 1.4.2010; Sanden 23.3.2010; NAN, File A.614, 'Joint United Nations High Commissioner for Refugees and World Health Organization Representatives on their Visit to Cassinga and to the Namibian Press', 2; 'Remember Cassinga' produced by SWAPO Party Archive, 2007; D. Shikongo 26.3.2007, 3. 65 D. Shikongo 26.3.2007, 15; 11.6.2007, 32, 35, 36, 39, 40. 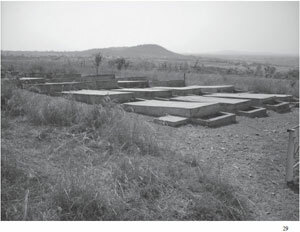 Other former inhabitants of Cassinga have also noted the grave's use as a storage space. See Vilho Shigwedha's forthcoming doctoral dissertation. 66 Canner and Theopholus Kalimba and Galiano Ntyanba, Interview 2.9.2007; T. Kalimba 1.4.2010; D. Shikongo 1.4.2010. 67 Kalimbas and Ntyanba, 2.9.2007; T. Kalimba 1.4.2010; D. Shikongo 1.4.2010; NAN, Institute for Contemporary History, Microfilm 78 F84, 'Desolation reigns as SWAPO buries dead', Daily Dispatch, 10.5.1978; Microfilm 78 F85, '460 in mass grave at scene of Angolan raid', Cape Times, 10.5.1978; [ Links ] 'IDAF Newscuttings Database', A.570 IDAF, 1/4, 249 A01.1A.049, 'Hundreds buried in mass grave at Angolan town after South African raid', 10.5.1978. 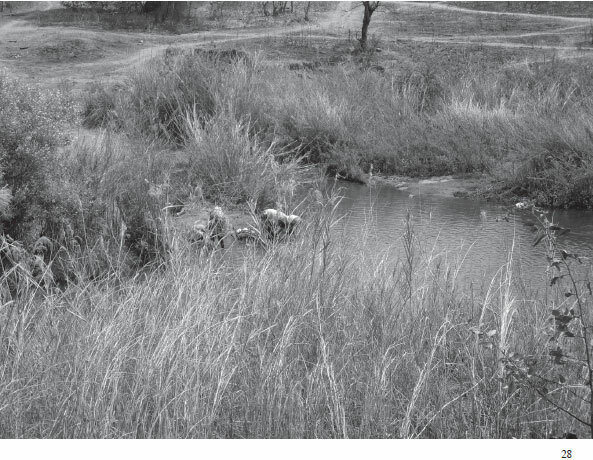 Some journalists, in later writings and interviews, indicate that they arrived at Cassinga and photographed the mass grave before May 8 (Pagano, (letter in The Kassinga File); Sanden 5.2.2008, 8). In contrast, camp officials interviewed for this research think that the mass grave was only filled after at least three days, and they do not recall presenting it to journalists before it was re-opened for them. 68 NAN, Institute for Contemporary History, Microfilm 78 F84, 'Desolation reigns as SWAPO buries dead', Daily Dispatch, 10.5.1978; Microfilm 78 F85, '460 in mass grave at scene of Angolan raid', Cape Times, 10.5.1978; 'IDAF Newscuttings Database', A.570 IDAF, 1/4, A01.1A.049, 'Hundreds buried in mass grave at Angolan town after South African raid', 10.5.1978; Pagano (letter in The Kassinga File); Sanden 5.2.2008, 8. 70 As one can see if it is compared with the previous photograph, this photo is taken from a slightly different angle. It appears identical to the one taken by Gaetano Pagano on May 6, 1978, included in The Kassinga File. 72 According to Charles Namoloh, he initiated the first renovation of the two mass graves in the early 1980s. At that time concrete was laid on both graves (Namoloh 19.6.2008). 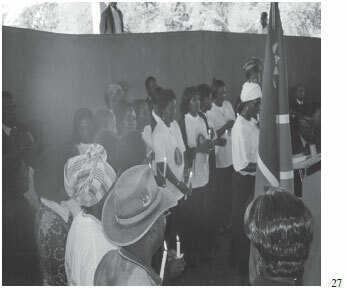 The 1988 commemoration of Cassinga Day was well covered in The Combatant. 74 Kalimbas and Ntyanba 2.9.2007. 75 Kalimbas and Ntyanba 2.9.2007. 76 Seminal texts on the Namibian government's reconciliation policy and its relationship to the 'detainee issue' are: Lauren Dobell, 'Silence in Context: Truth and/or Reconciliation in Namibia', Journal of Southern African Studies, 23(2), 1997, 371-382; [ Links ] C. Leys and J.S. 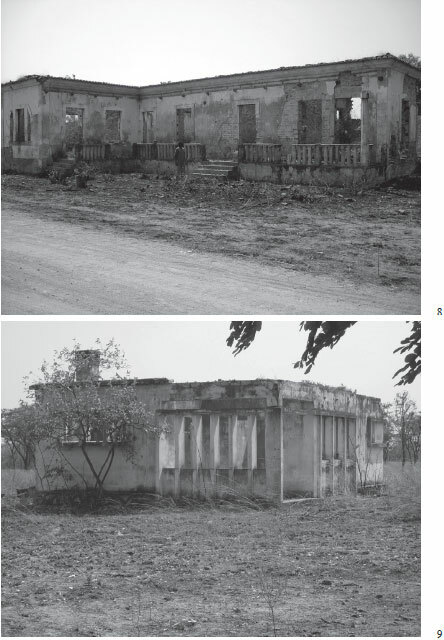 Saul, 'Lubango and After: "Forgotten History" as Politics in Namibia', Journal of Southern African Studies, 29(2), 2003, 300-325; [ Links ] J. Hunter, Die Politik der Erinnerung und des Vergessens in Namibia: Umgang mit schweren Menschenrechtsverletzungen der ära des bewaffneten Befreiungskampfes, 1966 bis 1989 (Frankfurt am Main: P. Lang, 2008). [ Links ] I also discuss these issues extensively, including accusations made in the name of Cassinga in my doctoral dissertation. Christian Ambler Williams is a Postdoctoral Fellow at the Centre for Humanities Research at the University of the Western Cape. His doctoral thesis from the University of Michigan is about military camps administered by SWAPO in exile. Many of the camps which he studied were located in Angola during the late 1970s and 1980s, including Cassinga.